Picture shows the ‘Columbarium Wall’, currently present in Glasnevin Cemetery, Dublin. At the October meeting of Clonmel Borough Council, news has emerged that Tipperary County Council have given consent for the provision of a Columbarium Wall for St Patrick’s cemetery, in Clonmel, Co. Tipperary. A Columbarium Wall is an area designed to provide interment space for the public’s respectful storage of cinerary urns. The name derives from the Latin word “columba”, meaning “dove”, and originally referred to the compartmentalized housing for doves and pigeons called a “dovecote”. 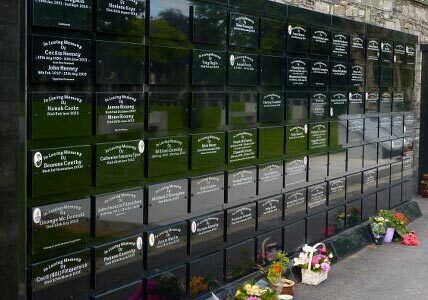 By no means a new concept here in Ireland; Columbaria Walls allow for the placing of cremated remains into small niches, each with a front section incorporating a memorial plaque. The cremated remains are then placed behind each plaque, in an urn which is specifically designed to accommodate the cremated remains of a deceased loved one. The outer memorial plaque is then engraved with an inscription and used to seal the entrance to the chosen niche. As a general rule each niche is designed to accommodates either one or two cremated human remains. The project is expected to go to the initial design stage with Tipperary Co. Council shortly, no doubt with the public being kept ‘firmly in the loop’.